Happy Monday! Hope you feel relaxed and rejuvenated from the weekend. Today, I'm sharing a recent bedroom e-design that can be described as just that. 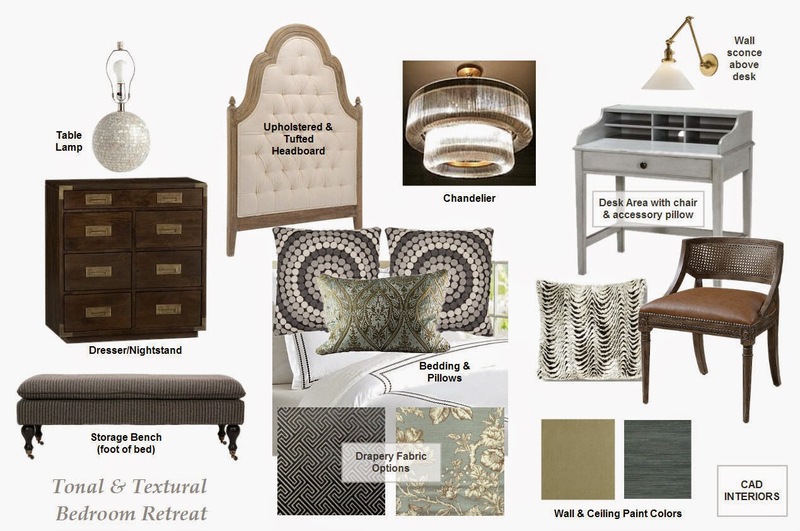 The goal was to design a tonal and textural bedroom retreat that promotes relaxation and rejuvenation. In order to achieve that, I incorporated soft hues, texture, dimension, and pattern without jarring contrasts in color. This bedroom design has a soft sophistication, but it is also relaxed and approachable due to the injection of wood tones and unstructured mix of fabrics and patterns. My favorite aspect of this design is actually the lighting. All three fixtures incorporate different aesthetics: "mother-of-pearl" table lamp, "waterfall" glass chandelier, and antique brass traditional wall sconce. Each bring their own whimsy, yet they all work harmoniously together due to their common neutral palette. Can you envision this bedroom retreat in your own home?! To see other e-design boards, click here. If you need assistance in pulling a room together, contact me for a complimentary design consultation. The e-design process (virtual interior design) allows me to assist you no matter where you live. Remember, for a limited time, I am offering 40% off all pre-booked e-design packages for 2015!